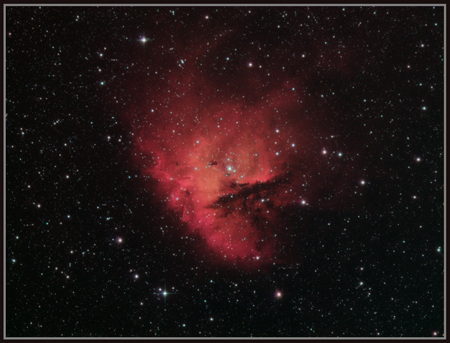 NGC 281, The 'Pacman Nebula' is a star forming region dominated by Hydrogen gas 9500 light years from us in Cassiopea. Ha used as luminance in 2 separate layers @ 50% opacity with saturation adjustments applied to the RGB layer between the application of the Ha luminance layers. This avoids the 'salmon pink' effect of a 50% or above opacity Ha luminance layer. The colour is mapped as....Red. Hydrogen Alpha, Green. Oxygen 3, and Blue. Hydrogen Beta.